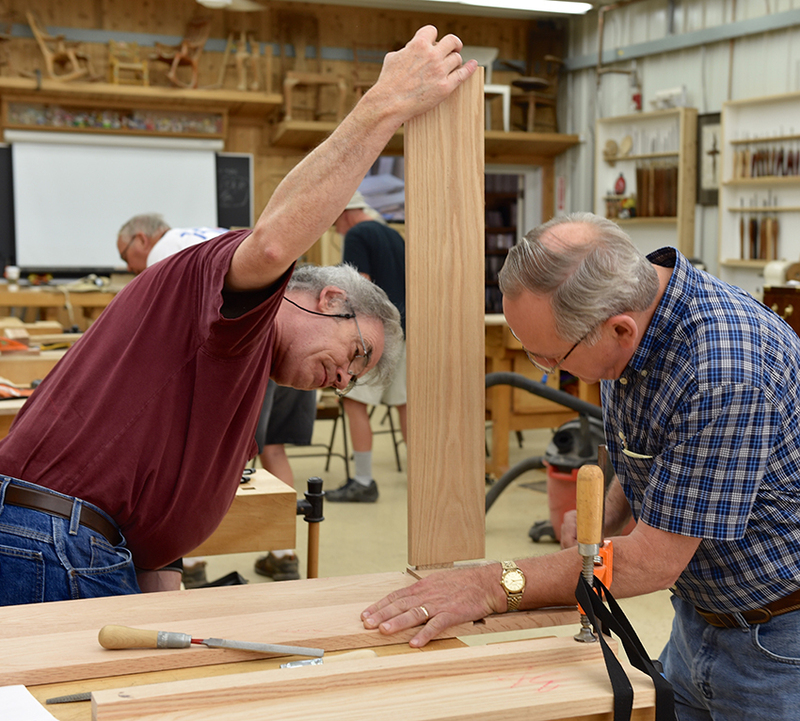 Last fall I spent a week at the Marc Adams School of Woodworking near Indianapolis, Indiana, leading a group of woodworkers in the construction of reproductions of the iconic Gustav Stickley/Harvey Ellis No. 700 Bookcase. Marc Adams’ classes are always enjoyable – the facility is first rate, the staff is incredibly helpful, and the students are the nicest bunch of people you can imagine. At right you see me at work, demonstrating a technique. The close up view is displayed on a big screen, and when break time rolls around there is a soft-serve machine in the cafeteria. I like to teach somewhat challenging projects and I think the value of a class like this for the students is the exposure to different ways of making things, especially the things they don’t think they will be able to do. My goal is to pass on skills and problem solving ability based on my real-world experience. When the class is over all the parts are ready for final assembly, but there will be fussing, fiddling, final assembly and finishing that may take a while to complete. In a project like this there are distinct phases, and while it would be nice to go home with a “finished” project that would mean a simpler piece and a day or two of class time spent sanding and watching glue dry. Since the class ended, I’ve been fielding questions by e-mail and the students have kept me posted on their progress (or lack thereof). Around Christmas I received the first picture of a completed case (from a guy who figured he was the last to get his done) and a week or so ago the fourth picture came in. I appreciate that the students share these images with me, and that I can share them with the world. They all did a great job and should be proud of their accomplishments. In a class like this knowledge gets passed on directly, it’s a lot better to see someone do it, and how to do it than it is to just read about it or see it in a video. There are dozens of little things I get asked that I wouldn’t think to include (or have room for) in a magazine article. And of course things can go wrong in class that need to be fixed. That almost always gets edited out in published work, but it’s likely the most valuable lesson to learn. One year I had a guy who was close to giving up woodworking because of one slip while using a router. It made him (and me) happy to find out that almost anything can be fixed. One of the cool things the staff does at MASW is take pictures throughout the week. The pictures in this article come from the school, and if you want to see images from though out the week, MASW makes them available online via smugmug. Early in the week I mentioned that in most of the images from an earlier class at least one student, and often several students could be seen holding their heads as if in pain, or at least under some degree of stress. I think from now on I will skip mentioning that. The smart alecs in this particular class took that as an invitation to have some fun at my expense the first time they saw a staff member with a camera. I will be back at Marc Adams this year teaching two project classes. 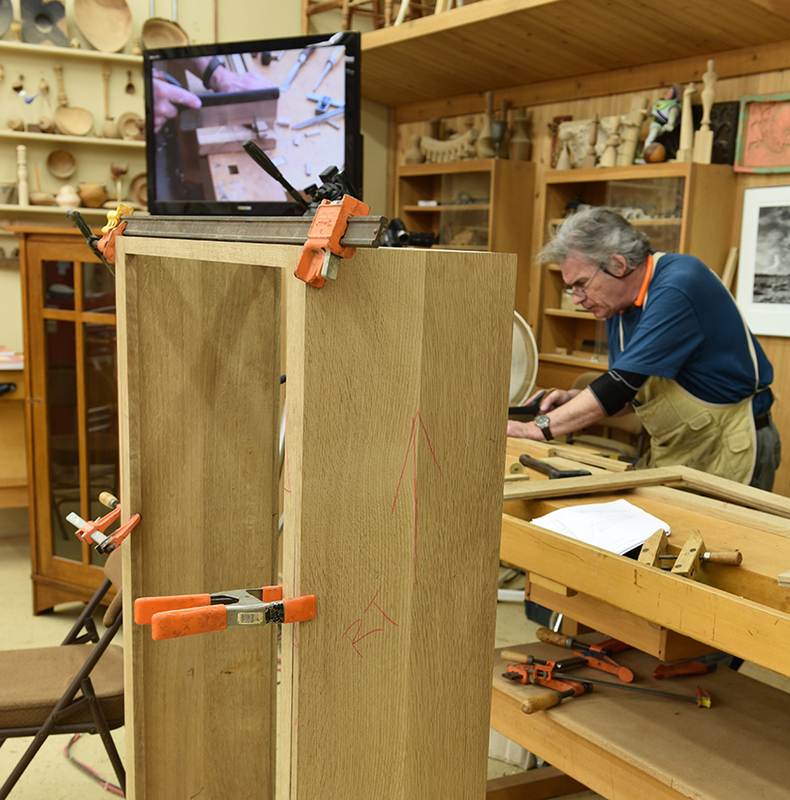 There is a week-long class in May where we will be making reproductions of a Gustav Stickley Bridal Chest, and in August there is a weekend workshop where we will be making reproductions of a Greene & Greene medicine cabinet.I will also be teaching a weekend SketchUp class in July. You can find more information and see images of the projects at this link. At the moment, there is still space available in these classes, and I hope you will join me. 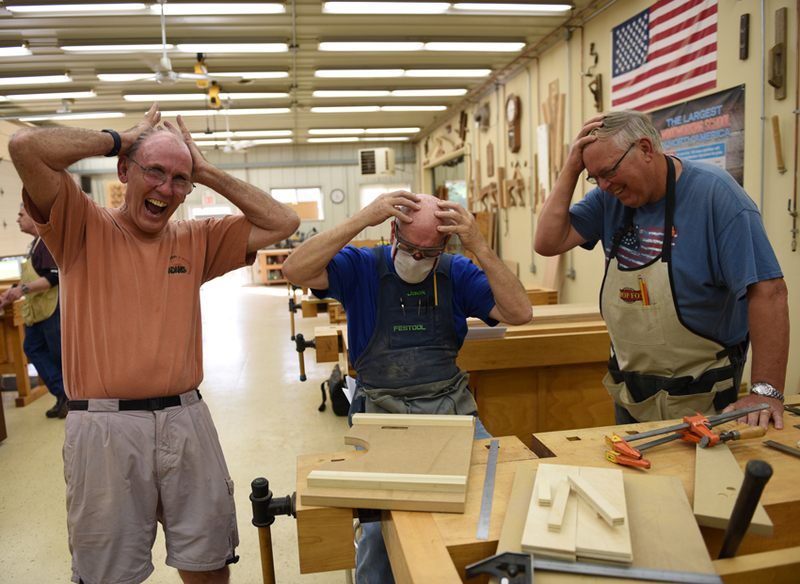 Visit the Marc Adams School or Woodworking website to sign up, and to see all of the available classes. Click on my signature below to send me an e-mail if you have any questions.